... Er tegn på regn i Spanien eller ”Rain in Spain” as the original song from My Fair Lady is called, this little fellow is a proof that we have had a week full of rain in Basel. 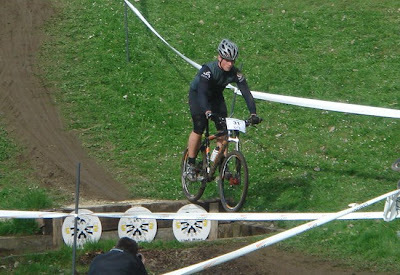 Saturday morning it was time for my second appearance in the Swiss Power Cup. 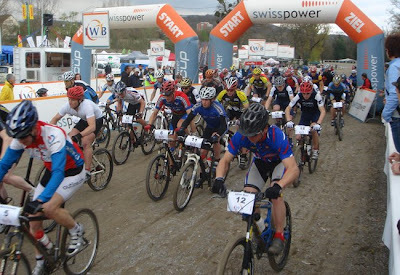 This time, the race was in Muttenz, which is just 5 km south of Basel. Next to the St. Jacobs Stadium, where the semi-final of the European Soccer Championship is being held to months from now, we were to start at 16.00 this Saturday afternoon. Anja and I spent the day shopping and relaxing, before I went to get my bike ready for the race. It was hanging in the exact same spot as I put it on, which proved that I have had no training during the last week. With six days of rain, i followed my friend Dirks advice and mounted a mud tire in the front. Narrow and with 35 psi, I thought it was the right choice for the hills south of Basel. 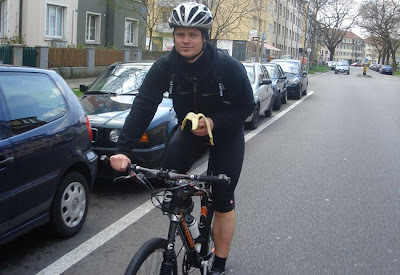 On the way to the race, my personal race support was so kind to equip me with a couple of bananas and an isotonic drink. Even so, I did not really feel in the mood for racing. My legs felt heavy and my body tired and I realized that racing in the afternoon is not my style. The sugar and Anjas smile helped me feel better and as we entered the horse track, where the start and finish area of the race was, I was about as ready as I could get. The race was fairly simple: one time around the horse track, out of the stadium on tarmac bike paths and up in the forest. Dirk told me that the first climb probably would be running with the bike due to the mud and the incline, and it turned out that he was absolutely right. The pack was more or less together when we reached the hill; I was taking it easy at the start and placed myself as around 30th of the 50 riders. Everyone got off his bikes on the climb and we ran as well as we could to the top. Unfortunately we had to do 100 height meters on the first climb, so it proved to be quite a challenge. 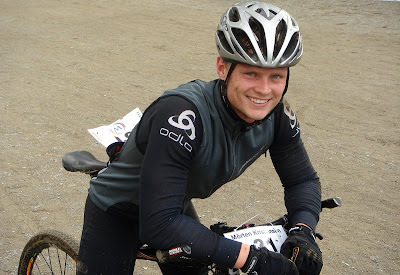 I passed a couple of riders before we reached the top, but then things started to go down hill – literately. We descended on muddy narrow trails with several drops and wooden lugs in the way. My narrow front tire did not help me much in the tight corners but it was slicing through the mud as quickly as I was capable off. After the decent, we came back on tarmac followed by a long section of flat single trail course. This trail ended by the horse-stadium, which we entered for the final part of the course. In the end of the technical course, we had to drop down a concrete wall about a meter tall and this time i did not pull the bike up enough so I went over the handlebar causing the crowd to go Ohhh! Newer mind, on the bike again and push in the pedals. I came out on the horse track and concluded that my Flying Circus impression has caused me to drop 5 places. The rest of the race went better and better for each round. The climb was still in running mode and I was slow on the downhill, but on the flats i was picking up speed and advancing a bit. The technical course still proved to be difficult, but I managed without scaring the crowd more that day. 4 rounds was the result of the day, feeling reasonable during the ride and most of all overcoming my apprehension for drops and jumps. 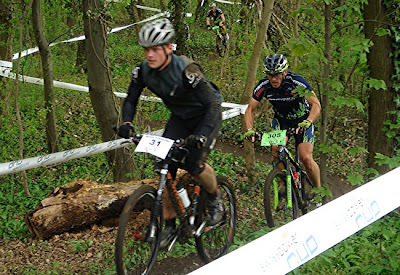 The mud was not as bad as expected and the race organizers had done everything they could to dry the course. Next time I’ll stay to Nobby Nick when it comes to tire selection, but thanks to Dirk anyway for the advice. Speaking of tire, I would like to recommend Maxxis Crossmark as a really good all-round rear tire. 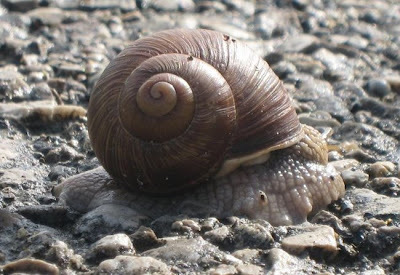 Fast but still with plenty of grip in most conditions.